The recent story from USAToday reports Arizona Senator John McCain has come out swinging against President Donald Trump and his new administration soon after McCain won another six-year term in the Senate, his sixth term in office. McCain, who back on December 29th of 2016 was reported to be seeking stronger sanctions against Russia, has also just warned Trump he'll fight him on his plans of lifting sanctions against them. In a new story over at the Gateway Pundit they report George Soros-funded Media Matters is secretly working with Facebook to fight 'fake news' aka anything that isn't globalist propaganda. According to an explosive report released by the Washington Free Beacon, the radical group is assisting Facebook with helping them identify what they deem to be “propaganda” and “fake news” in what many are calling a clamp down on free speech and a boxing out of conservative media on the social media giant. 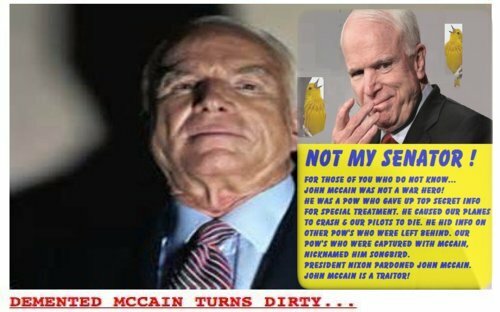 In another story published over at the Daily Mail that the Drudge Report linked to back on January 12th that had the Drudge headline "Demented McCain Turns Dirty", we see McCain admit "I did what any citizen should do" after he turned over the 'golden showers smear dossier' on Trump to the FBI. Doing so even though he admitted he had no idea whatsoever if the information it contained was credible, we see McCain's behavior akin to that of snowflakes melting down in the streets of America and Starbucks coffee shops: Senator John McCain pushing 'fake news' within the US Capitol. And as we learn below, there is likely a very good reason for that. 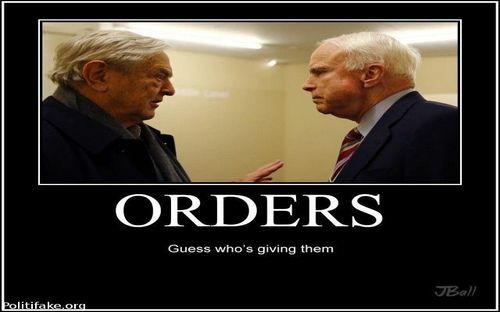 The story that came out on WND written by Jerome Corsi all the way back on February 12th of 2008 reported that McCain has long been funded by, of all people, George Soros....dating back to at least 2001. Corsi reported then McCain had founded an Alexandria, Virginia based Institute called 'the Reform Institute' under which it received funding from Soros' 'Open Society Institute'. McCain was even forced to cut his ties to 'the Reform Institute' when he ran for president back in 2008 but by then, the damage was done. The Reform Institute proves that Senator McCain is another 'Soros stooge'. With Trump now firmly in office, why should we be concerned? As we see in news headlines below from all across America over the first week of Trump's presidency, massive cases of Trump derangement syndrome are breaking out everywhere with more and more people calling for Trump to be impeached, removed from office or otherwise 'taken down'. And knowing Senator McCain's ties to ISIS terrorists as outlined below and his past as a 'songbird' that is more than happy to 'sing' gives us great reason to be concerned about where his loyalty lies. One week into Trump's presidency, the MSM is still in total 'meltdown mode'. Satanic, liberal Hollywood has also picked a fight with our new president. CNN's own president recently made a veiled threat at Trump while confirming that CNN is more than happy to 'push fake news' about him. As Susan Duclos reported days ago, 'nasty, man-hating women' are also going on an all-out offensive against Trump (most of their groups ALSO funded by George Soros as shared in this story and the 3rd video below) while leftists lunatics calling for love torch cars and outright verbally or physically attack anybody who doesn't see eye to eye with them. And as Susan Duclos tells us in the first video below, with the mainstream media still happy to push 'fake news', most recently with the Washington Post claiming that the entire upper tier of the US State Department had resigned when in all actuality they had been fired, we see that the 'enemies of America within' are going nowhere and are fighting on. As Stephen K. Bannon recently called them, the MSM is 'the opposition party'. Completely beholden to Hillary Clinton during the election, it appears the MSM will stop at nothing to bring down President Trump. Going back to 2014 in a viral John McCain interview with Sean Hannity on Fox News, McCain actually admitted to 'meeting with ISIS' and staying in contact with them. If you want to hear McCain himself making those admissions, you can hear him in the 4th video below. Knowing that McCain is still in Washington DC should send out a huge alarm. In fact, his face should have the very phrase 'TERM LIMITS' written all over it. Should America trust 'enemies of America within' who have very clear ties to terror, Senator John McCain leading the way? If you're one of the 'still sleeping' who believe that the US would never have ties to terrorists, we ask you to please take a look at Hawaii Democratic Congresswoman Tulsi Gabbard's STOP ARMING TERRORISTS bill for clarification. “Under U.S. law it is illegal for any American to provide money or assistance to al-Qaeda, ISIS or other terrorist groups. If you or I gave money, weapons or support to al-Qaeda or ISIS, we would be thrown in jail. Yet the U.S. government has been violating this law for years, quietly supporting allies and partners of al-Qaeda, ISIL, Jabhat Fateh al Sham and other terrorist groups with money, weapons, and intelligence support, in their fight to overthrow the Syrian government. “The CIA has also been funneling weapons and money through Saudi Arabia, Turkey, Qatar and others who provide direct and indirect support to groups like ISIS and al-Qaeda. This support has allowed al-Qaeda and their fellow terrorist organizations to establish strongholds throughout Syria, including in Aleppo." The new story from Infowars reports that the 'Stop Soros' movement is now sweeping Europe. 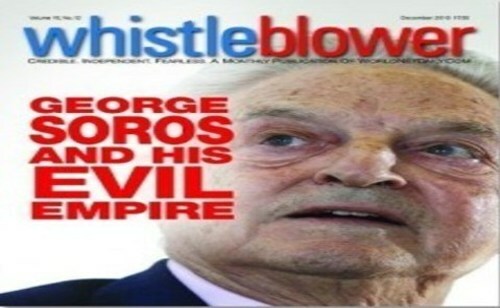 The man largely behind the mass immigration of Muslim's into Europe, even his own home country of Hungary is making moves to eliminate all NGO's funded by globalist Soros. During a press conference last week, SOS founders called on all “free-minded citizens,” regardless of race, ethnicity or religion, to “fight against one-mindedness in the civil sector, which is devised and led by George Soros,” the Vecer newspaper reported. This move comes on the heels of the Hungarian government announcing that it will use “all the tools at its disposal” to target and “sweep out” all non-governmental organizations funded by Soros, a Hungarian-born financier who has become one of the U.S. Democratic Party’s major sources of funding, according to Hungarian Prime Minister Viktor Orban’s ruling party. Co-founder of the movement, Nikola Srbov, called out Soros for hijacking civil society, in an effort force his own personal ideology upon others by monopolizing civil discourse through strategically funding certain organizations via his group Open Society Foundations. Soros set up the Open Society Foundation in in the 1980s with the stated goal of helping former Soviet bloc countries transition from communism, but in reality, the foundation is used to destabilize governments and foment discontent within countries. And while McCain is a 'Republican' like Trump, he and Senator Lindsey Graham of South Carolina have come out against Trump 'guns ablazing'. Clearly part of a very concerted 'globalist snowflake effort' to take down our 45th President, we're incredibly grateful for all of the good people surrounding Trump, ready to give their own lives if necessary to protect him from all of the insanity that Soros, McCain and the globalists have unleashed upon the world. And as we read in the closing comments we'll give below to Theodore Shoebat, John McCain is no saint and what we're clearly witnessing with his ties to Soros and other 'enemies within' and to the ISIS terrorists who want to destroy us, a very real 'axis of evil' is aligned against the American people, willing and ready to take America down to the level they lie on. "John McCain is a giant bag of scum; his mouth is a continual sewer of bile, his heart is a decayed rot of dung, his mind a river of filth, and his soul is amongst the damned. He is nothing but a murderous scumbag. His evils are so great, that the words of Trump don't even bother me. McCain is a demon incarnate. His service in Vietnam does nothing to justify the evils he has supported and pushed for."